From December 14 through January 5, tens of thousands of volunteers throughout the Americas take part in an adventure, the Christmas Bird Count, which has become a family tradition across generations. Here on the Palouse, the Moscow-Pullman (IDMP) Christmas Bird Count (CBC) has been a continuous, annual event since 1971, with more counts dating back to 1914. The Lewiston-Clarkston (IDLC) CBC has been nearly continuous since 1999, and the Juliaetta-Lower Potlatch River (IDJU) CBC was officially inaugurated in 2012. Together with the other volunteers, we make an enormous contribution to conservation. Audubon and other organizations use data collected in this longest-running wildlife census to assess the health of bird populations and to help guide conservation action. We rely on enthusiastic volunteers, from beginners to seasoned veterans; everyone is welcome to participate. And, if being outside all day is not for you, feeder watchers are welcome, too. Everyone who takes part in the Christmas Bird Count does it for love of birds and with the knowledge that their efforts are making a difference for science and bird conservation. Contact information, maps, instructions, tally sheets, and more can be found at Palouse Audubon CBC (currently under construction) and even more information is available at Audubon’s Christmas Bird Count website. The Great Backyard Bird Count is an annual four-day event that engages bird watchers of all ages in counting birds to create a real-time snapshot of where the birds are. Everyone is welcome–from beginning bird watchers to experts. It takes as little as 15 minutes on one day, or you can count for as long as you like each day of the event. It’s free, fun, and easy—and it helps the birds. Participants tally the number of individual birds of each species they see during their count period and enter these numbers on the GBBC website. As the count progresses, anyone with Internet access can explore what is being reported from their own towns or from anywhere in the world. 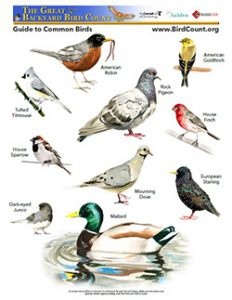 For more information, see The Great Backyard Bird Count.